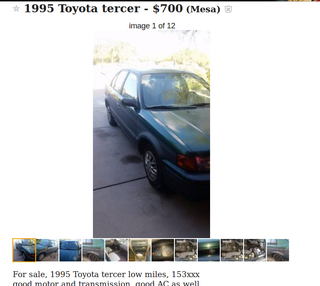 What's this "Toyota Tercer" I keep seeing on Craigslist? Seriously, it’s everywhere but I can’t find anything when I google it. Every single one I’ve seen has some godawful hubcaps. Was it some cheapo factory appearance package? I’m genuinely interested and curious. Also, when I search “tercer” on it’s own, turns out it means third in spanish. So does that mean the 3rd hubcap’s missing?